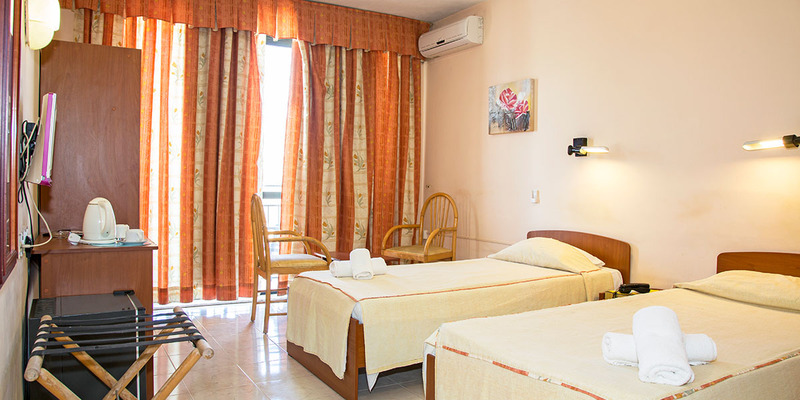 This small familiar bed & breakfast hotel is centrally located in the heart of the tourist center of Bugibba, with its extensive choice of restaurants, cafés, taverns and number of shops right next to the hotel. The attractive seafront promenade is ca. 150 meters away and here one can find rocky beaches, water sports possibilities and boat rides to St. Paul’s Islands and the Blue lagoon in Comino. There is a Bus stop close to the Hotel, while the St. Pauls Bay Central Bus Terminus with direct services to all parts of the island can be reached in ca. 15 walking minutes away. The Scheduled Bus Service offers regular and good connections to Valletta (40 Bus minutes away), Mdina (30min. ), the entertainment center of St. Julians (25min.) and the sandy beaches in the north (20 minutes).